How The Luggage moves will define the impact1 of this robot, so we've got to make sure that all the bits and pieces will work together to give the desired effect. We'll want it to move at a sensible rate, and to accelerate to that speed suitably to convey the "angry" emotion properly, and finally the hardware purchased should enable that. So how fast should The Luggage go? Fortunately our requirements tell us that we're after "walking pace". In terms of doing engineering calculations, however, that number is about as useful as a chocolate teapot2. Trust me, what you really want is all the numbers to be in SI units. This makes all the sums nice and easy, without silly conversions and thus reducing the chance of making a mistake. The metric system units are all nicely related so that if you are trying to accelerate a mass of 1kg with a force of 1N, you'll need to provide that force for 1s in order to achieve a velocity of 1m/s. 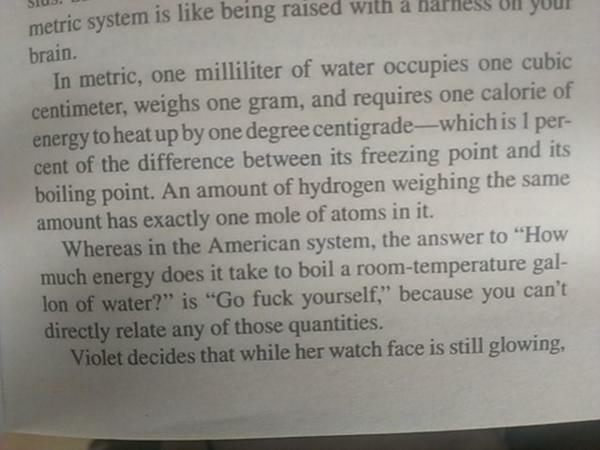 Imperial units are never as kind (bad language warning). So what's our velocity in SI units? The simplest method of getting The Luggage to move would be to have the motors directly attached to the wheels. This reduces the mechanical complexity and reduces the opportunity for losses (more about this latter part in a subsequent post). So if we're going to hope for this nirvana, we'll need to calculate how fast the motor should turn. We can afford to do some rounding here to make our lives easier (remember, this is just a quick calculation to show that the planned hardware configuration is about right). Rounding in this case is OK because of the required accuracy of our result, an approximate answer will do (given that we'll be guessing at some of the numbers), but something less accurate like Fermi estimate wouldn't be helpful. Great, that's the speed sorted. How about acceleration? All we need to do this calculation is a requirement about how fast we'd like the Luggage to reach it's top speed. How about half a second? Good, now we've got an estimate of the requirements of the motors for The Luggage. How does the servo identified last time check out? Well, those don't exactly line up with our requirements. Dang. But wait, the torque provided is greater than the required torque and the speed provided is lower than the speed required. If only there was some way to convert the speed and torque of a motor shaft to another shaft! Huzzah! Gears will save the day. If we use some gears between the motor and wheels we can modify the speed and torque of the shaft to get closer to what we're after for The Luggage. The product of speed and torque will remain the same through an ideal gear linkage, so if one goes up, the other must come down. I suggest that a gear-ratio of 3:1 should just about do it for The Luggage, as this should give the sort of acceleration we're after, and a reduced top speed. Assuming that there is no mechanical losses in my gears. Ahem. We'll see about that later. 2OK. Perhaps not that chocolate teapot. I'm impressed that you had the discipline to do these calcs first rather than putting everything together and then scratching your head when it went too slow! The gears look really good, did you use some clever OpenSCAD library? Just to show I'm paying attention I think you have rounded pi up to 6 in the intermediate calculation for wheel circumference. Thanks for the catch on the rounding error, now corrected. It wasn't just the unforseen mechanical losses that caught me out, basic tank steering theory hurt me too. But more about that later!